MACKINAW CITY — Crews continue to remove coolant fluid from electric cables that sprang a leak in the Straits of Mackinac earlier this week. The U.S. Coast Guard says about 600 gallons of mineral-based synthetic oil escaped into the waterway linking Lakes Huron and Michigan. The cables are operated by Wisconsin-based American Transmission Company, which has taken them out of service. A company contractor is removing about 800 gallons of oil remaining in the two damaged cables. The Coast Guard says about 10 percent was sucked out Wednesday. Coast Guard air crews haven’t spotted any oil on the surface. But the calculated trajectory of the spilled mineral oil is to the south and southwest of the source, a Thursday press release from the Coast Guard states. Given the dilution of the product and the mobility of fish, there continues to be a low risk to fisheries and wildlife, authorities said, but a concern remains that waterfowl or shore birds may come in contact with the product floating on the surface, and the response team is exploring methods to deter birds from the area. The Coast Guard deployed an MH-60 Jayhawk crew from Coast Guard Air Station Traverse City on Monday and Wednesday afternoon to search for pollution over the Straits of Mackinac. The flight crews used infra-red technology to detect temperature differences between the oil and water and did not locate any oil sheen or signs of pollution, the press release states. Coast Guard overflights are expected to continue to monitor the spill. Scott Schaefer, incident management specialist with the Michigan Department of Environmental Quality, said members of his department are continuing to work within the response team to address the situation. 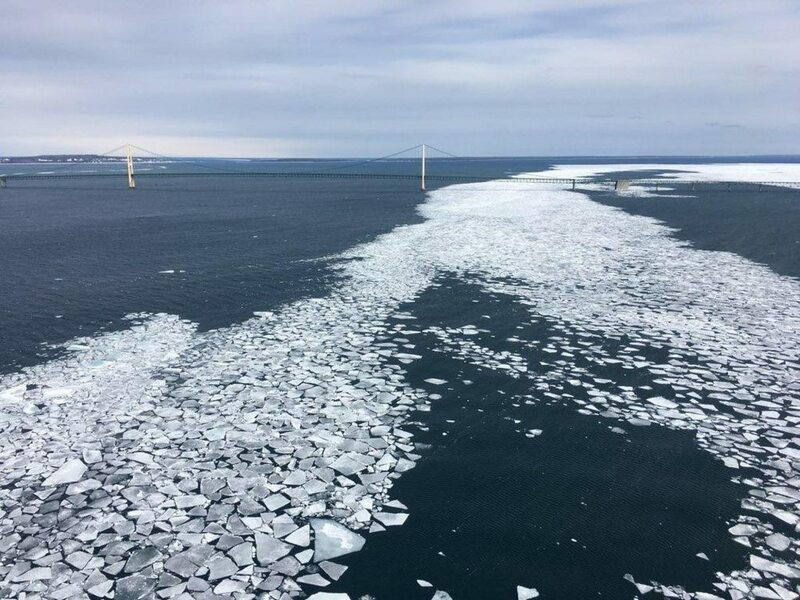 “We are working with the American Transmission Co. and our federal, tribal and local partners to address the release of mineral oil to the Straits of Mackinac,” Schaefer said in the release. In consultation with engineers from the Pipeline and Hazardous Materials Safety Administration and the DEQ, a 10-person work crew and vacuum truck are on site for the contractor working to draw the oil out of the two decommissioned utility lines. No pressure is being applied to the lines, and a suction, or negative pressure, is present on the entire span, authorities said. Due to the inaccessibility of the shorelines from ice, the threat to the public is low since they are unable to come in contact with the oil, officials said. The dilution of the oil and distance from the bridge and water intakes provide additional protection from the product.